2001 marked the 4th year that the Alumni Association awarded a bursary to the current HSR Staff. For a second year we were fortunate to receive an additional donation from the 101st Toronto Troop Alumni, who are one of the first groups to have camped at HSR. A $400 donation, in memory of Owen Cliff, allowed the Alumni to award a total of $1,000 to our two most deserving applicants. The $400 Owen Cliff Memorial Bursary was awarded to Justin Way. 2001 was Justin’s 5th year on staff. He served as an SIT, Store Clerk, Acting Store Manager and Assistant Store Manager. Justin also worked on the parade night float, plaque and yearbook committees and co-captained on the staff cricket team. 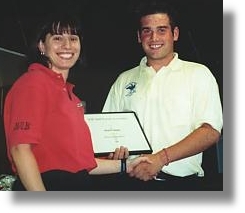 Justin started at Brock University in September 2001 to take Recreation and Leisure Studies. The $600 HSR Staff Alumni Bursary was awarded to Brad Grabham. This summer was also Brad’s 5th year on staff. Brad has worked as an SIT, Trapper, Trapper/maintenance, Senior Rappelling Instructor and SIT Coordinator/Rifle Instructor. In addition, Brad has worked on yearbook and plaque committees, parade night float and co-captained the staff cricket team. 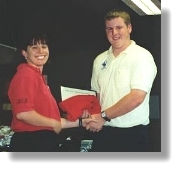 Brad was the recipient of the 2000 Supervisor’s Award, bestowed annually to staff who actively demonstrates belief in the Scout Law and Promise. Brad began his second year of Business at Brock University in September.